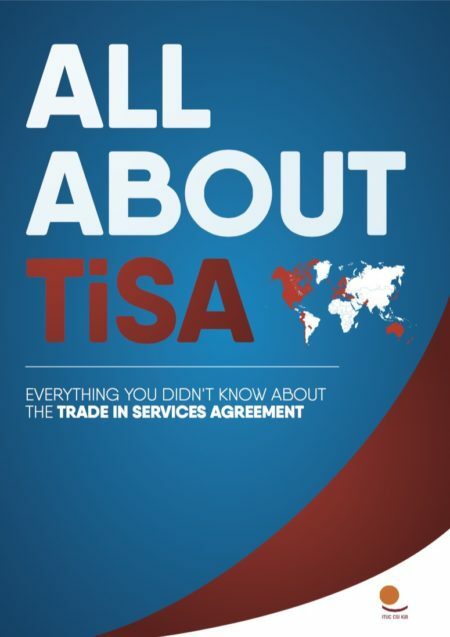 From the limited leaks to the public on TiSA, the scope of the treaty’s coverage appears vast, spanning transportation, energy, retail, e-commerce, express delivery, telecommunications, banking, health, private education and more. Services make up the majority of economic activity in most countries, affecting virtually all aspects of life and society. Unlike international trade in goods, services trade is not normally subject to import tariffs or other border restrictions. Instead, the “barriers” to cross-border trade in services being targeted by TiSA negotiators involve national and local regulations, such as foreign ownership restrictions, licensing requirements, differing quality standards, financial regulations, universal service obligations, and public services (which by their very nature can close off large parts of sectors like health or education to for-profit service providers). The aim of the talks is to facilitate the entry of global service corporations into domestic markets by restricting government regulations that might interfere with these companies’ commercial aims and activities. The TiSA impinges on a wide swath of issues related to foreign investment, public interest regulation and even the temporary movement of workers and potentially has far greater and more intrusive impacts on democratic authority than traditional trade-in-goods agreements.